LOS ANGELES, CA and NEW YORK, NY--(Marketwire - June 4, 2007) - On Thursday, May 17th, 2007 in Los Angeles, California, the game of poker was changed forever. Casino operators and poker players around the world witnessed the next evolution in poker as the dealer, the chips and the cards all went virtual. The Hustler Casino in Los Angeles was the first card room in the world to adopt the FastDeal™ poker table that also includes a kiosk with an automated cashier that allows players to create an account, add money to an existing account, and perform and cash-out operations. The FastDeal table offers live, face-to-face play of all types of poker games and limits, without the need for live dealers, cards or chips. The speed and efficiency of online games are combined with the advantages of a live environment as players physically sit at a 10-person table and interact with other players. All aspects of the game play are automated, from dealing to winner payouts, so hands are played faster, downtime is reduced and players can focus on the game they love. As the game of poker continues to gain in popularity, brick-and-mortar casino operators and poker rooms are continually searching for ways to improve their poker offerings by streamlining game play, increasing the revenue per hand, and improving the player's overall experience. The FastDeal Poker table merges the best features of online poker play, with the real life benefits of playing in the same room as your opponents. Poker Automation partnered with Arkadium (www.arkadium.com) and ihsoft (www.ihsoft.net), two expert software companies in the world of gaming, to create the FastDeal poker table. 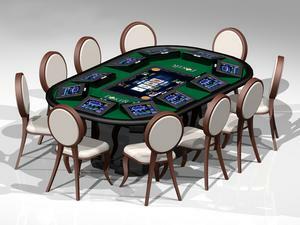 Arkadium licensed its poker software to Poker Automation and customized it exclusively for the FastDeal poker table. Poker Automation also announced that the FastDeal poker table has received GLI certification as well as California Department of Justice approval to operate in the state of California. FastDeal tables are available immediately. For more information log on to www.pokerautomation.com or call 310-229-5749.